Schools earn Scholastic Rewards by running Book Clubs and Book Fairs, and also through purchases made by parents and teachers from our shop – we donate 25p in Scholastic Rewards to a school of the customer’s choice for every £1 spent on the Scholastic Shop on orders over £10. 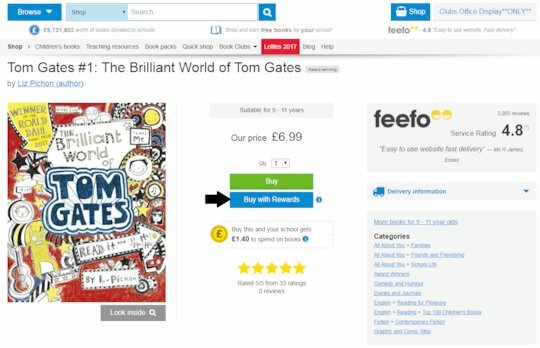 Rewards can be used by schools to purchase, at full RRP, most of the thousands of children’s books available to buy from Scholastic. If you’re browsing the shop and find a product you’d like to buy using your Scholastic Rewards, just select the ‘Buy with Rewards’ button to add it to your basket. Don’t select the ‘Buy’ button. Please also note your voucher number will not work in the Promotion Code field. Can’t see the blue button? You need to log in to the site and tell us where you work. If you still can’t see the button, it means that particular product isn’t available with Rewards. If you know what you want to order and are using one of our Quick Order forms, you can just enter into the ‘Rewards qty’ box the number of items you’d like to pay for using Rewards. 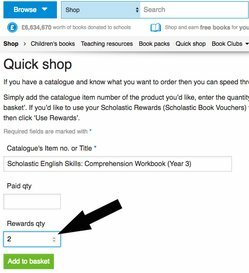 If you change your mind about which items you’d like to pay for using Scholastic Rewards, you can just go to your shopping basket and amend the quantities in the ‘Paid qty’ and ‘Rewards qty’ columns. Example 1. This customer will be paying for two Comprehension Workbooks using Scholastic Rewards. They will be paying for one National Curriculum Textbook by credit card or invoice.